How many cookies does the average person eat over the course of a lifetime? 500? 5,000? 5 MILLION? I’m not sure but since life is short, I believe it’s important to make your cookies count. Cracking open a box of Chips Ahoy might scratch an itch much like sleeping with a prostitute probably scratches a different sort of each. Neither is a good idea but people do it. I say, if you’re going to eat a chocolate chip cookie, there’s only one cookie to eat and that’s the best chocolate chip cookie in the entire world, the chocolate chip cookie at The City Bakery in New York. This isn’t hyperbole, this is fact. I’ve eaten cookies all across the country, all around the world. I’ve had the famous Levain Bakery flying saucer of a chocolate chip cookie several times. I’ve had chocolate chip cookies in Atlanta, Seattle, Los Angeles, San Francisco. I’ve had chocolate chip cookies that I’ve made myself, in many different ways. 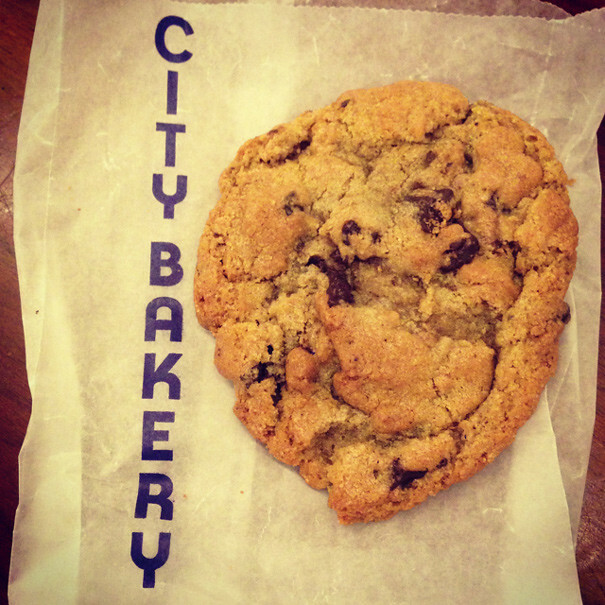 But none comes close to the City Bakery cookie. What makes it so good? David Leite tried to find out in this now legendary New York Times article. It boils down to this: Maury Rubin (City Bakery’s owner) lets the cookie dough age for 36 hours and he makes large cookies so the cookies form three different textures. I’ve tried this at home many times and though both techniques yield excellent cookies, nothing ever comes close to the cookie you get at City Bakery. I have theories about that, theories that some might call conspiracy theories. One: City Bakery uses a special flour that no one else can get because it’s so special. Two: Maury Rubin is a wizard. Maybe it has something to do with his ovens. Maybe it has something to do with his cookie sheets. The cookies are crisp on the outside, moist in the middle, and taste vaguely nutty. If I could only eat one cookie for the rest of my life it would be this cookie. Part of me is glad that I can’t make this at home because if I really knew how, I probably wouldn’t make anything else. 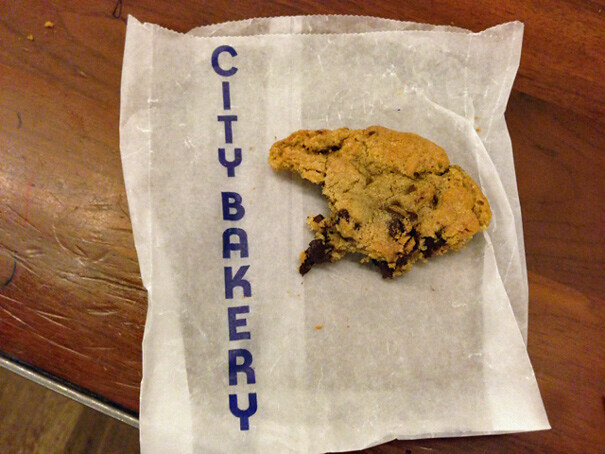 Suffice it to say, if you’re ever in New York, a visit to City Bakery is mandatory. Make sure to buy two cookies: one for you, and one to ship to me. It’s the right thing to do.